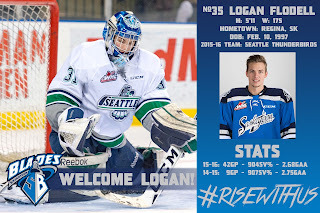 The Seattle Thunderbirds, having acquired a goaltender on Friday, dealt G Logan Flodell, 19, to the Saskatoon Blades on Saturday, getting back D Anthony Bishop, 18, in return. . . . The Thunderbirds picked up G Rylan Toth, 20, from the Red Deer Rebels on Friday. . . . Flodell, from Regina, was a third-round pick in the 2012 bantam draft. He got into 54 games over three seasons with Seattle, going 26-17-5, 2.84, .899. Last season, he was 22-13-4, 2.68, .904, but he finished up playing behind Landon Bow, a 20-year-old who was acquired from the Swift Current Broncos. . . . The Blades are expected to open the season with Flodell and Brock Hamm, 19, as their goaltenders, although freshmen Dorin Luding and Joel Grzybowski, both 17, remain on their roster. . . . By acquiring Bishop, the Thunderbirds filled a hole created by the sudden retirement of Jared Pelechaty, 17, who was found to have a congenital spine issue that left him susceptible to injury. . . . Bishop, a list player from Kelowna, had two assists in 40 games with the Blades last season. This preseason, he has four assists, three of them on the PP, in five games. The WHL’s exhibition schedule concluded with eight games on Saturday. The regular season opens with nine games on Friday. . . . Here’s a brief look at what happened Saturday . . .
At Crowsnest Pass, Alta., F Lucas Cullen scored his third goal of the preseason, at 4:35 of OT, to give the Calgary Hitmen a 2-1 victory over the Kootenay Ice. . . . F Murphy Stratton gave Calgary (4-2-0) a 1-0 lead at 4:48 of the second period. . . . F Michael King tied it for the Ice (0-3-2) at 16:50 of the third. . . .
At St. Albert, Alta., veteran F Jesse Shynkaruk scored twice to help the Saskatoon Blades to a 5-4 victory over the Edmonton Oil Kings. . . . Shynkaruk, who is hoping to land one of the Blades’ three 20-year-old spots, scored twice on the PP, giving the Blades 1-0 and 5-3 leads. . . . F Mason McCarty had two goals and an assist for the Blades (3-3-0), who got four assists from F Braylon Shmyr and two from F Logan Christensen. . . . The Oil Kings (2-3-0) got three assists from D Jordan Dawson. . . .
At Everett, F Layne Bensmiller, who was acquired earlier in the week, scored the only goal of the shootout as the Seattle Thunderbirds beat the Silvertips, 4-3. . . . Bensmiller was acquired from the Prince Albert Raiders in a deal in which F Nic Holowko went the other way. Bensmiller met his new teammates prior to boarding the team bus, then went out and scored in regulation time, too. . . . F Cavin Leth had a goal and an assist for Seattle (5-2-0). . . . Everett (2-3-2) got a goal and an assist from F Riley Sutter and two assists from F Spencer Gerth. . . . Seattle G Ryan Gilchrist started and stopped 13 of 16 shots in 30:15. Carl Stankowski came on to turn aside all 23 shots he saw through OT and three more in the shootout. . . .
At Moose Jaw, F Jayden Halbgewachs scored twice and added an assist to lead the Warriors to a 4-2 victory over the Swift Current Broncos. . . . F Brayden Watts had two assists for the Warriors (4-3-0) and F Nikita Popugaev added a goal and an assist. . . . The Warriors got 18 saves from G Adam Evanoff, while Taz Burman stopped 26 for the Broncos (5-2-1). . . .
At Red Deer, G Duncan McGovern put up his second shutout in as many nights as the Medicine Hat Tigers beat the Rebels, 3-0. . . . McGovern stopped 18 shots. One night earlier, in Ralston, Alta., he blocked 14 shots in beating the Rebels, 4-0. . . . Last night, the Tigers (4-2-0) got a goal and an assist from each of F Gary Haden and F Josh McNeil. . . . The Rebels (3-3-0) got 32 stops from G Riley Lamb. . . .
At Regina, the Brandon Wheat Kings broke a scoreless tie with two goals in the last 20 seconds of the first period en route to a 6-4 victory over the Pats. . . . F Stelio Mattheos got Brandon (3-2-0) on the board at 19:41 of the opening period and F Tak Anholt added another goal at 19:59. . . . Regina F Nick Henry tied the score 4-4 with his second goal of the game, and fifth of the preseason, at 12:34 of the third period. . . . Brandon D James Shearer scored on the PP, at 16:01, to win it. . . . F Ty Lewis had a goal and two assists for Brandon, with Anholt adding an assist to his goal. . . . D Chase Harrison and F Dawson Leedahl each had two assists for Regina (3-4-1). . . .
At Spokane, F Curtis Miske’s third preseason goal, a PP score at 1:11 of OT, gave the Chiefs a 3-2 victory over the Tri-City Americans. . . . Tri-City F Michael Rasmussen forced extra time with his fourth goal, at 11:44 of the third period. . . . The Chiefs (4-3-0) led 2-0 at 13:17 of the first period, on goals from F Dominic Zwerger, his first, and F Kailer Yamamoto, his third. . . . F Vladislav Lukin got the Americans’ first goal, his third, at 17:20 of the first period. . . . Spokane F Jaret Anderson-Dolan and D Ty Smith each had two assists, while Yamamoto also had one assist. . . . Rasmussen and Lukin each added an assist. . . . G Beck Warm turned aside 42 shots for the Americans (3-4-1). . . . Spokane G Jayden Sittler stopped 17 shots.